Complaint: I took my vehicle to Daytona Toyota of Daytona Beach, Florida for an electric window problem. I ended up paying for a window regulator replacement and labor. At the time I was not aware that my husband had previously been experiencing a problem with the window that was clearly switch related. I am convinced that Daytona Toyota charged me for parts and labor that were unnecessary. I have been trying to send the service manager a letter of complaint but have had no luck obtaining a mailing address. 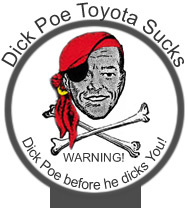 I wouldn't take my vehicle to Daytona Toyota of Daytona Beach, Fl. for service. Complaint: I bough an 05 Scion TC. The drivers seat started discoloring.No one locally could fix it.We were told any fix had to be authorized by Ray at SE Toyota.after months & months and 2 trys the replaced the seat covers and here we are 3-4 months later its discolored again same place same seat.I think its something in the foam. We got into a screaming match with the service manager and demaned to speak to the owner who of course wasnt there and then the next day a guy named kyle from the service dept called my husband to make an appointment to spead with Ray from SE toyota for the upteenth time ans when my husband got there he was taken into a stairwell with the owner and another large man, cussed out and told never to come back and they will now not service my vehicle even though i have paperwork stating I get free oil changes for life. Love those strong arm tactics.